Which Superfood do YOU need right now? Hey ya'all. Ever wonder which superfood you need most? We've broken it down by feelings. Eating your nutrients beats popping a pill because your body absorbs the nutrients in their whole form. Energy: Raw Cacao contains a high source of magnesium. According to population studies, 30% of Americans aren't getting enough. Low magnesium levels are a common cause of low energy levels since this mineral has more than 300 uses in the body. Pure raw cacao is the one of the highest food sources of magnesium.Maca is also a great energy enhancer + stamina builder. 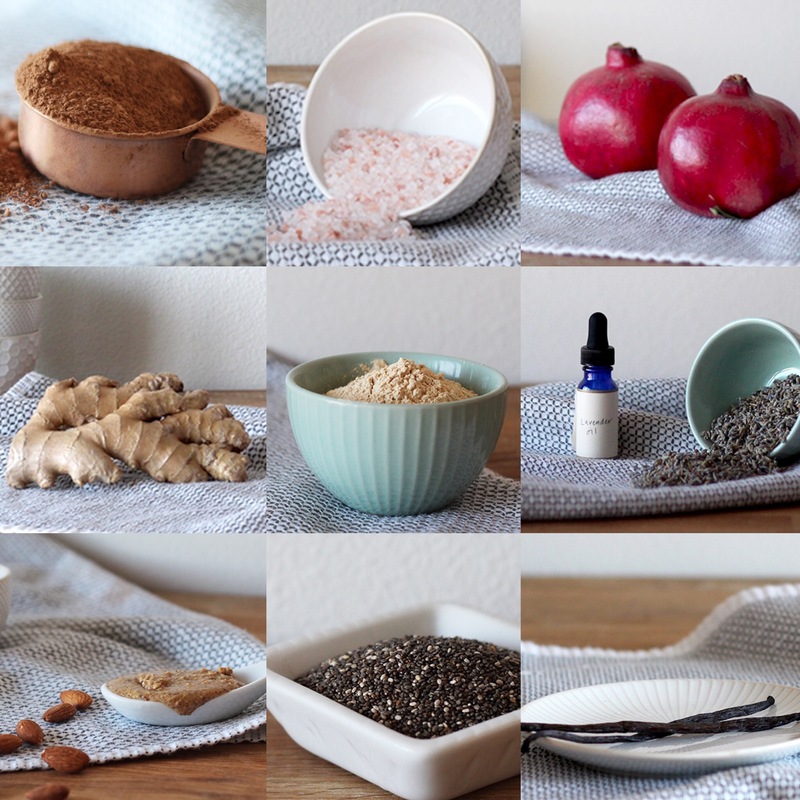 Digestion + Immune Boosting: Ginger is known to rev up digestion and promote immunity. Antioxidants promote immunity so eat some pomegranate and cacao. Protein + Repair: Grab something packed with nuts or coconut. Cacao also has protein and helps curb appetite and speed up metabolism and repair muscles. Love: Rose is heart opening. 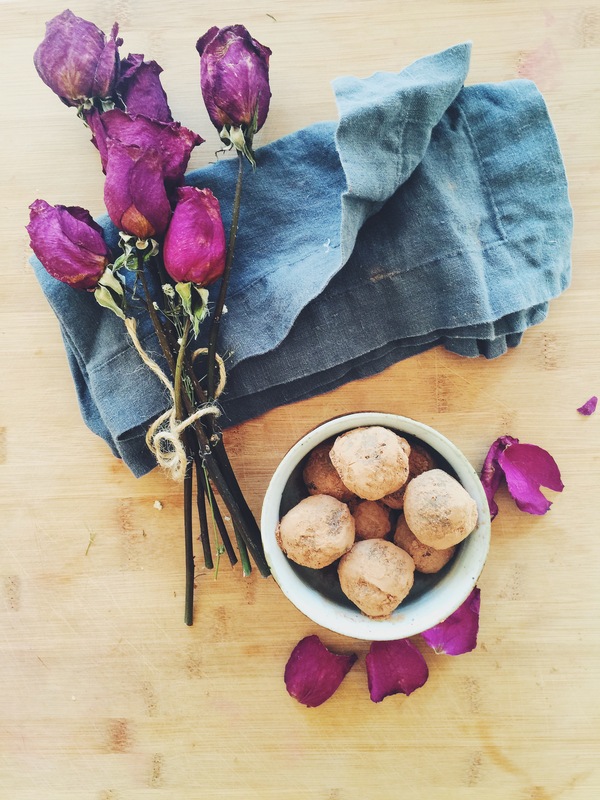 Maca is also hormone balancing and libido enhancing. Calming: Lavender is an naturally calming herb. Real sea salt is packed with trace minerals which also helps muscles relax. It’s time to say sayonara to that pre-packed brownie mix full of chemically produced ingredients and preservatives. BYE GIRL. 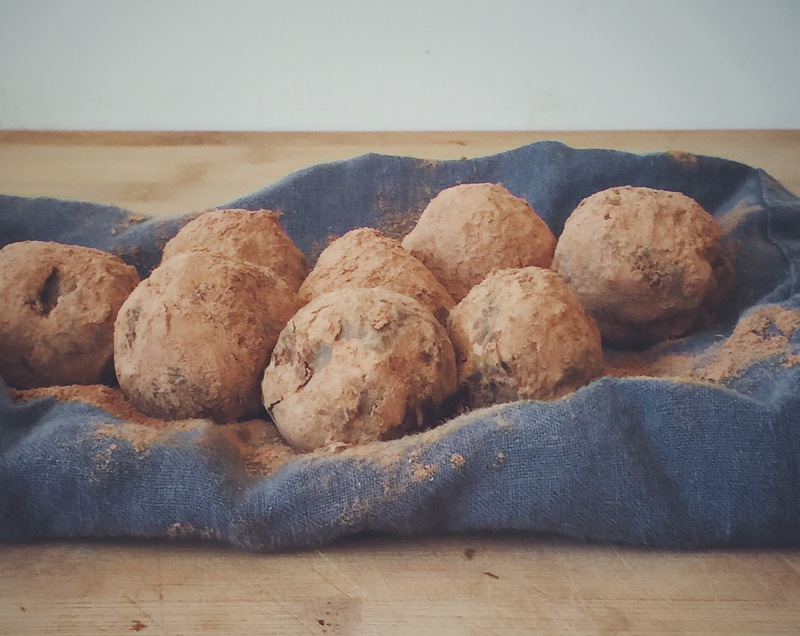 These fudgey, chocolatey balls are intensely addictive, insanely easy to make, and super satisfying for sugar-affectionados, minus ANY added sugar! They’re all raw, totally vegan, dairy free, gluten free, with no refined sugars. We swear these will be your new go-to. Yields 10 one inch balls. Blend all ingredients - except coconut flakes and NYSM chocolate - in food processor (we used a Magic Bullet) until a sticky dough forms. In a bowl, knead coconut flakes and chopped chocolate bar into the mixture. Roll into balls. And presto, finito! Tip: We like to keep these babies in the freezer. The dates keeps them soft and the coolness makes these treats even more satisfying! If you try this recipe, feel free to have a little fun and use your creativity! Try oats, sunflower seeds, bits of chopped dried mango or ginger. Take your favorite flavors and run with it. We’d love to hear what worked for you! What in your life are you avoiding right now? Notice the energy that this feeling creates in your body. See if you can drop the urge to change whatever this thing is and just accept it for what it is (even if just for a moment) and send it love. Notice the energetic shift that this creates. Let us find peace in our lives by fully accepting what is in front of us instead of resisting and avoiding what is. When we are looking at our lives through the lens of fear, we create feelings of suffering and want things to be different, but through the lens of love, we remove the veil of illusion and everything feels lighter and just as it should be. This way of viewing things takes a little more conscious effort as we are collectively programmed for fear but this is not normal even though we've grown to believe that it is. Love is real, fear is not. In what ways can you be more loving and accepting of your life?